October 7th marks the one day that pet owners and their pets are welcomed to attend the same mass at Saint John the Divine in New York City. A day inspired by St. Francis of Assisi, whose life exemplified harmony between humans and nature is an annual festival service that includes the "Blessing of the Animals" followed by an afternoon fair. The Fair’s themes – celebration of Creation, Compassion, and Faithful Stewardship of the Earth – align with the vision and work of Saint Francis. Visitors can expect to see an eclectic variety of animals follow a procession up the nave of the Cathedral that will include a yak, a tortoise, baby swans, a macaw -- in addition to a few surprises. 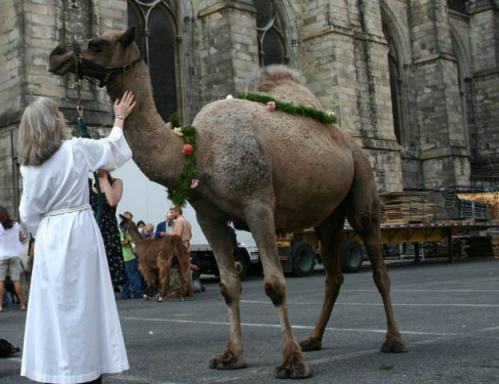 For instance, in 2007 this camel RSVP'd and showed up dressed for the occasion. You might also spot a golden eagle, a monkey, hermit crabs, reindeer and/or lovebirds flocking to the Morningside Heights venue. 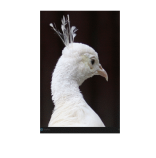 Also while touring the cathedral's campus, you might get a chance to catch a glimpse of the church's mascots, namely 2 peacocks and their pea-hen leader that goes by the Twitter handle of @CathedralPhil. Each year holds special moments that sets it apart from years past. Paul Winter and his Consort performed the Earth Mass/Missa Gaia in 2007 to mark the day and on October 2, 2001, less than one month following 9/11, rescue dogs from the WTC site led the procession into the Cathedral. 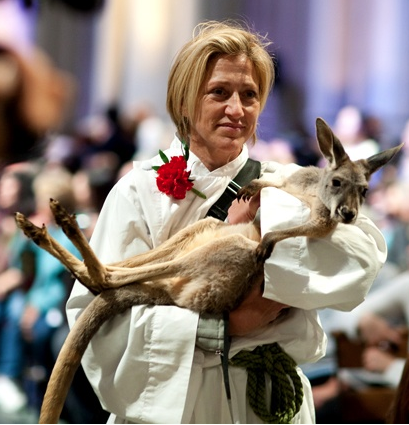 Last year, Edie Falco from The Sopranos and Nurse Jackie fame was a star attraction when she entered the church with a kangaroo. Advance public passes are currently SOLD OUT for this year. However, additional passes will be distributed outside the Cathedral the morning of St. Francis Day, on October 7 (The distribution of passes begins at 9:15 am on a first come, first serve/one pass per person basis). For those that have already secured advance passes, you can pick up your passes the morning of St. Francis Day at the "Will Call" table in front of the driveway located on 111th Street and Amsterdam Avenue, directly south of the Cathedral. Crocodile, in the clerestory Sports window. Dragon, in the exterior St. Columba chapel and in the St. Ansgar Chapel left window. Elephant, on the front door, lower left portal. Ape, on the Medical window. 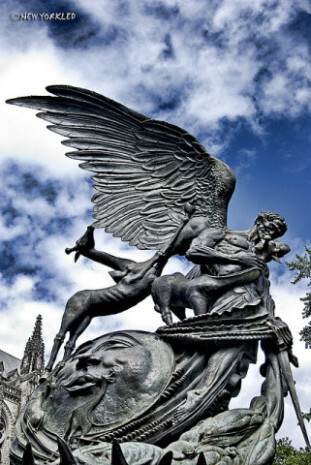 Fountain of Peace sculpture -located within the Children's Sculpture Garden (next to the church) depicting the triumph of Good over Evil.